When it comes to art glass made purely for decorative purposes, Favrile pieces crafted by Louis Comfort Tiffany’s studios are among the best. This is also among the most highly sought after and expensive glass in the antique marketplace. In 1894, Tiffany registered the name Favrile and began production in earnest a couple of years later. Some sources say this fancy term is derived from the Old English word for hand wrought: febrile. Others mention faber as a source, the Latin word translating to “craftsman.” Regardless of the inspiration for this moniker coined by Tiffany, even before it was registered a number of Favrile objects were introduced at the World's Columbian Exposition in Chicago in 1893. But what does Favrile really mean? Simply put, it references the handcrafted art glass (and some pottery as well) produced by Tiffany, much of which was iridescent in appearance. It can be relatively monotone in color or finished with a mottled “oil slick” finish. The iridescent look was achieved by spraying metallic salts on hot glass, and they were absorbed to form a lustrous finish. Going beyond that, the name Favrile is the embodiment of the handcrafted ideal held by the Arts & Crafts movement coupled with nature-based Art Nouveau influences often shown in the free-form shapes of the glass. For example, while he didn’t invent the style, Tiffany is said to have named the Jack in the Pulpit vase after a flower found growing on his estate on Long Island in New York. Tiffany Studios made many Favrile examples of these vases in varied colors during the early 1900s. The popularity of this glass led to thousands of pieces being made through 1933. Many collectors with deep pockets compete for these pieces when they come on the market today. They can also be viewed in museums around the world including examples held in the vast Tiffany collection of the Charles Hosmer Morse Museum of American Art in Winter Park, Florida. It’s interesting to note that upon seeing Steuben’s version if iridescent glass, Aurene, that Tiffany thought his beloved Favrile was being copied. He was so incensed, he filed a lawsuit against Frederick Carder’s company. As it turned out, Steuben's lines were completely innovative. Tiffany found that the method employed to manufacture the new iridescent glass was very different than that used to make Favrile and the suit never fully materialized. However, after leaving Tiffany & Co., Martin Bach, Sr. did use the formulas learned while working with the firm to manufacture glass, according to The Collector’s Encyclopedia of American Art Glass by John A. Shuman, III. Quezal Art Glass and Decorating Company made iridescent glass in vivid colors such as blue, gold, purple, and green. While the formula for the finish was reportedly the same, Quezal did incorporate some unique patterns and shapes in their lines. Loetz Witwe also produced iridescent glass said to be inspired by Tiffany’s Favrile beginning in the 1890s. In fact, this Austrian factory’s most significant pieces were made during this period, and they contributed greatly to the company’s success at that time. 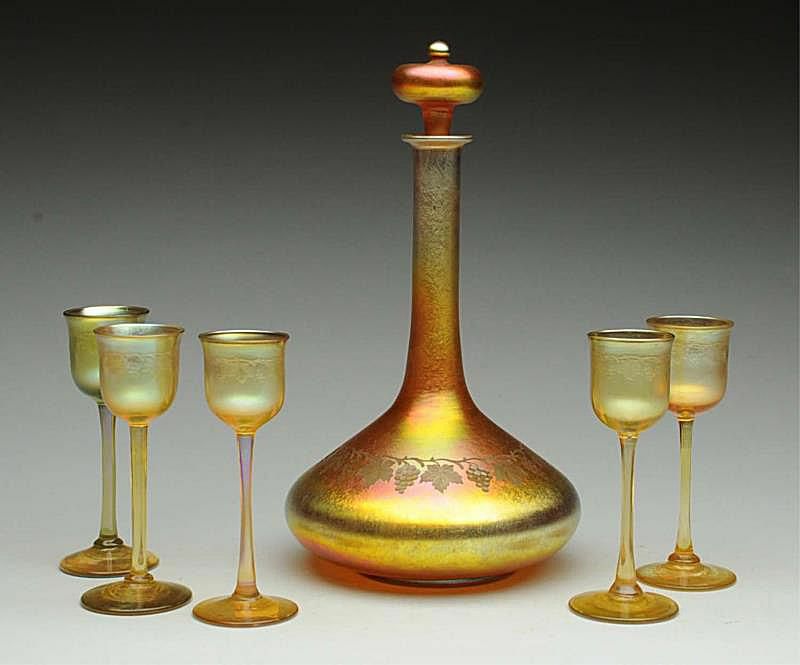 The patented iridescent Phänomen glass (a type unique to Loetz decorated with rippled or feathered patterns) designed by Franz Hofstätter won a grand prize at the Paris World’s Exposition in 1900 alongside Tiffany. “Tiffany achieved an outstanding expression in glassware of the Art Nouveau style. Much of his work was in a heavily lustered glass that was considerably admired abroad, especially in central Europe where it created a new fashion,” according to a feature on Britanica.com. But in all honesty, historians haven't really determined which company or craftsman was first inspired to create iridescent decorative glass (especially when it comes to the rivalry between Tiffany and Steuben), according to Antiques Roadshow art glass expert Arlie Sulka in an online article. There’s no question, however, they were all in competition during the late 1800s moving into the 20th century making a very popular type of ware. Mentioning Tiffany’s competitors is important, especially when looking to identify and authenticate genuine Favrile pieces. Yes, there have been times that individuals have taken unmarked antique iridescent glass made by other companies and inscribed a Tiffany signature on the bottom of the piece. Of course, the more you study the variations from manufacturer to manufacturer, the better you get at distinguishing authentic Tiffany wares. The colors in the iridescent finish tend to vary and Favrile pieces are often more muted in coloring, with gold being a prime example. Shapes can also be similar, but there are many subtle variations from manufacturer to manufacturer of antique iridescent glass. Consider studying Tiffany Favrile Art Glass (Schiffer Books), or another title offering many Tiffany examples to learn what to look for in authentic pieces in terms of styles and colors. There are also many different styles of signatures on Favrile pieces, but the way they are marked often tells the tale of authenticity. “Signatures 9 times out of 10 are etched on the underside base counter clockwise. If you turn a piece over and look at the base, you will see the signature under the center pontil going from left to right. There are exceptions to every rule, but this is what you will find on the majority of pieces made,” according to art glass expert Reyne Haynes Hirsch in an article for Heritage Auctions. Because this glassware commands so much money, usually sums into the thousands, you have to take extreme care when purchasing it. Study, consult experts in the field when in doubt, and buy from dealers with experience in high-end art glass whenever possible. Did You Know Cranberry Glass Is Made with Gold?